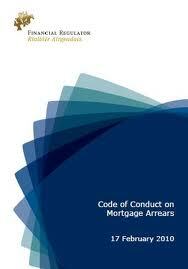 Central Bank Code of Conduct on Mortgage Arrears-Much Needed Protection for the Distressed Homeowner? The Code of Conduct on Mortgage Arrears 2010 is a critically important document for anyone in arrears with the mortgage on their primary residence. The primary residence, incidentally, does not have to be occupied if it is the only residential property owned by the borrower in the State. A March, 2012 High Court decision in Stepstone Mortgage Funding Limited v Fitzell has held that in order to successfully obtain an order for possession that the lender has complied with the Code of Conduct on Mortgage Arrears 2010. To hold off proceedings for possession for 12 months from when the mortgage enters the Mortgage Arrears Resolution Process. This process should be used prior to legal proceedings being commenced and the lender must tell the borrower that the Mortgage Arrears Resolution Process is being applied to his/her loan which can only occur after 31 days from the mortgage arrears occurring. The bank’s Arrears Support Unit must assess a Standard Financial Statement that the bank requires the lender to fill out. When repossession proceedings have commenced but have been adjourned on the basis that a revised payment arrangement has been entered into with the lender then if this arrangement breaks down the bank is required to review the failure and seek a new Standard Financial Statement. If you find yourself in mortgage arrears with your primary residence, and increasing numbers of people in Ireland are, you should contact your lender and contact the Money Advice Budgeting Service (MABS). You would also be well advised in consulting a solicitor and possibly the New Beginning group.